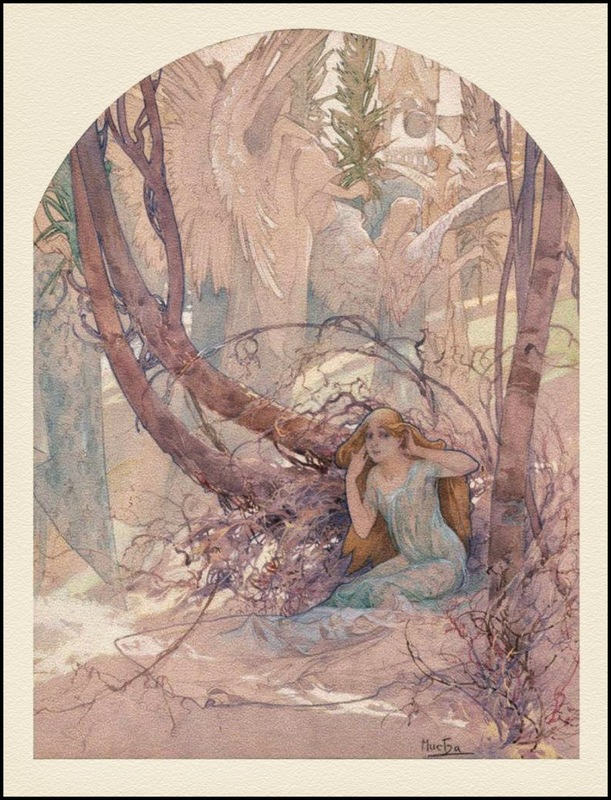 Illustrations of Alphonse Mucha are very satisfying to my eyes, even when I'm not familiar with the story involved. Here, the young lady hears something...possibly the angels tromping by or the bells swinging like there's no tomorrow. Either way, it's a lovely graphic work, is it not? If you know the story involved here, please do share. The old days, the old ways, promoted world travel with most compelling graphics. 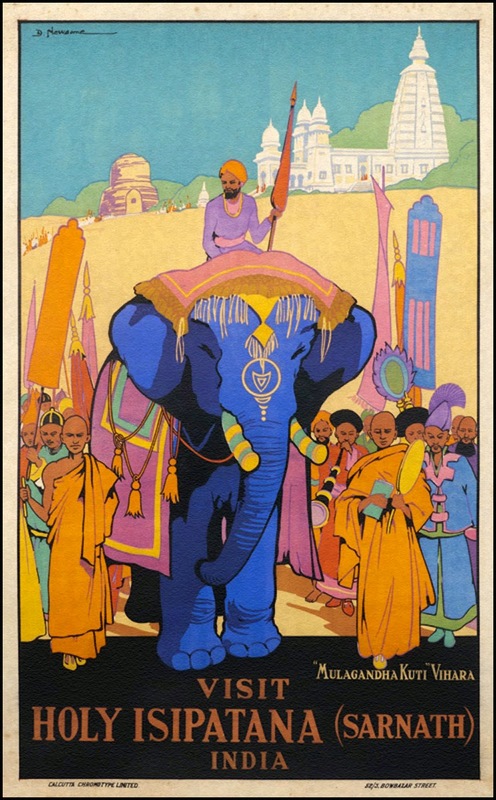 Travel posters were glorious. Isipatana means the place where holy men fell to earth, based on the legend that when the Buddha was born, devas came down to announce it to 500 holy me. 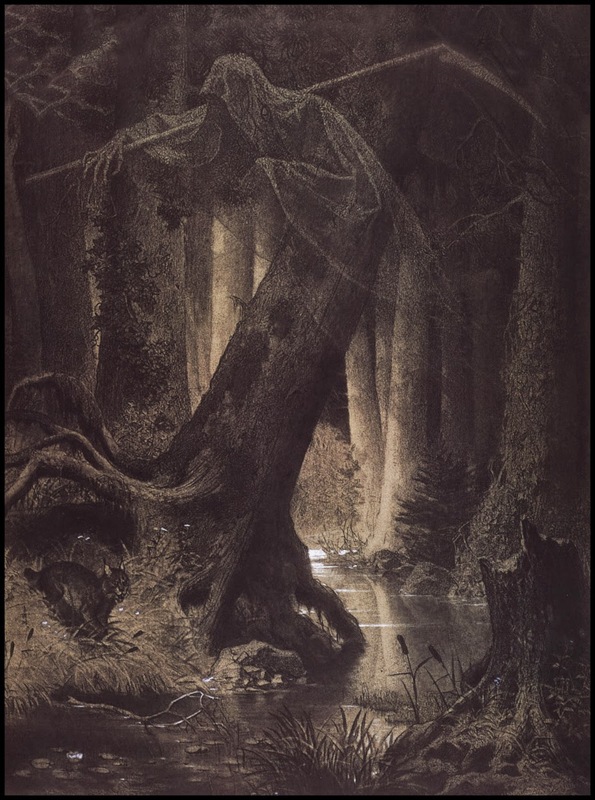 The holy men all rose into the air and disappeared and their relics fell to the ground. Sounds like an extraterrestrial close encounter. This poster portrays a Buddhist pilgrimage to the sacred site. but this is the most pleasing one for me. 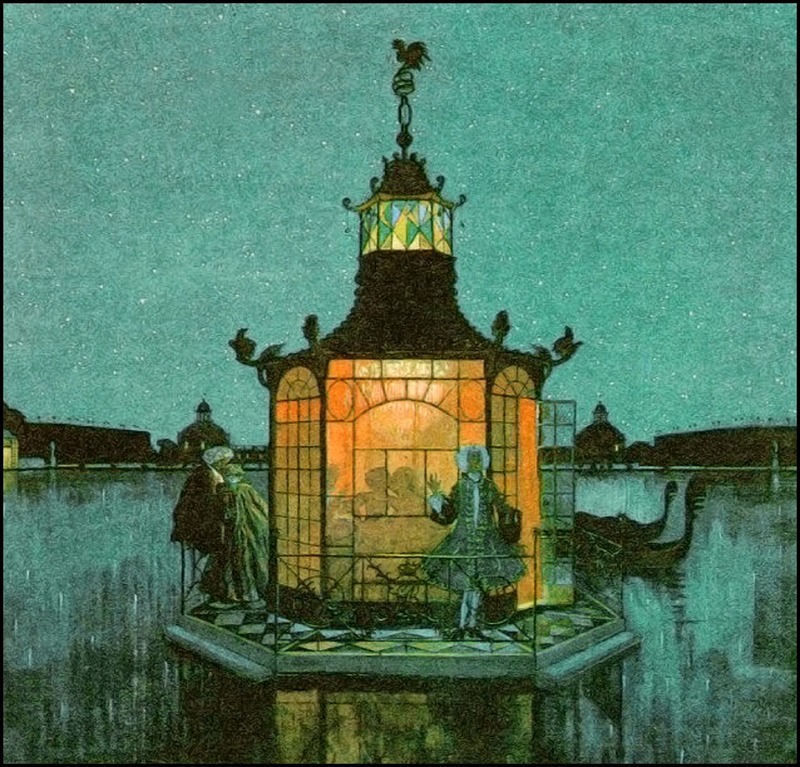 This is "The Night", as it was 99 years ago . . . 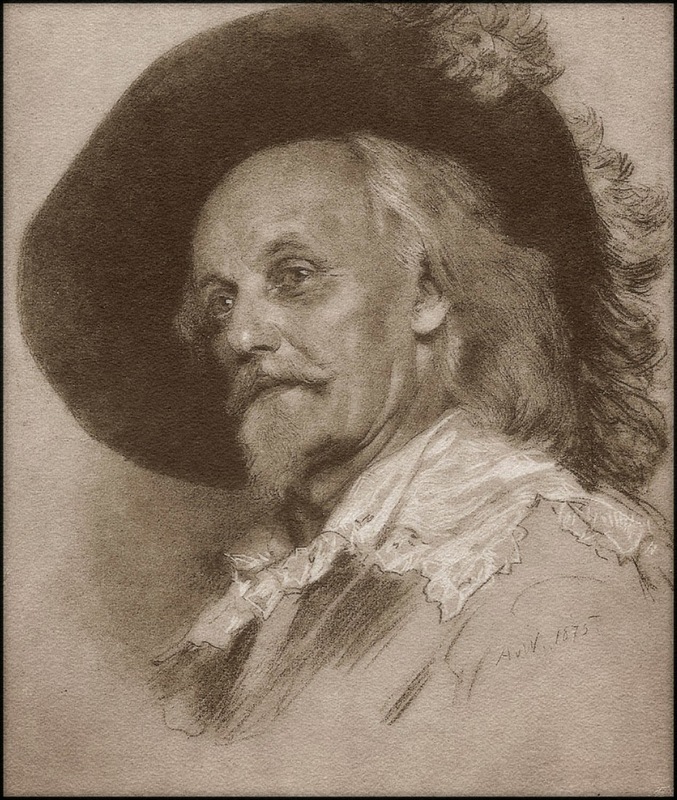 This piece is what art elitists would think of as lowbrow art, kitsch, or art for the masses. Yeah . . . so? 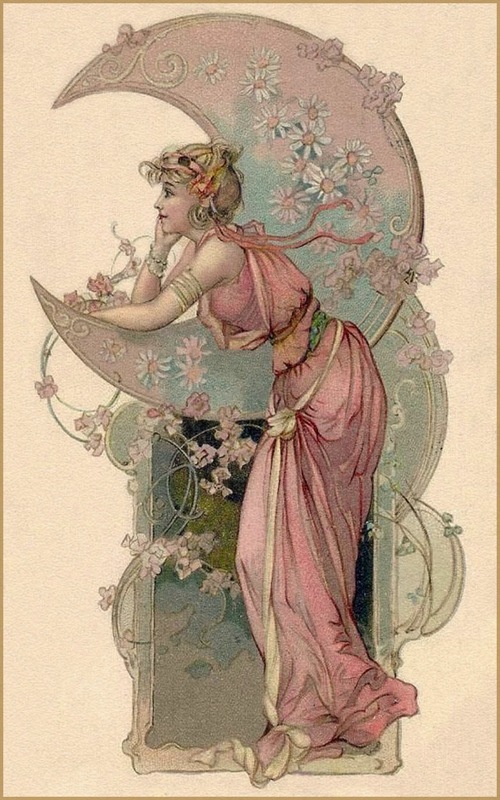 I think it's a charming Art Nouveau graphic that isn't by Mucha for a change. 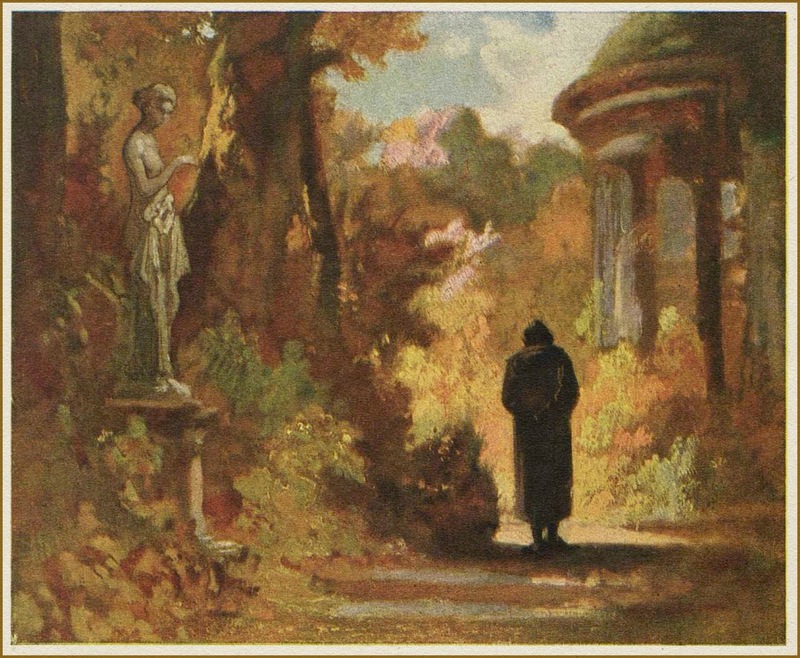 It's from an old postcard. 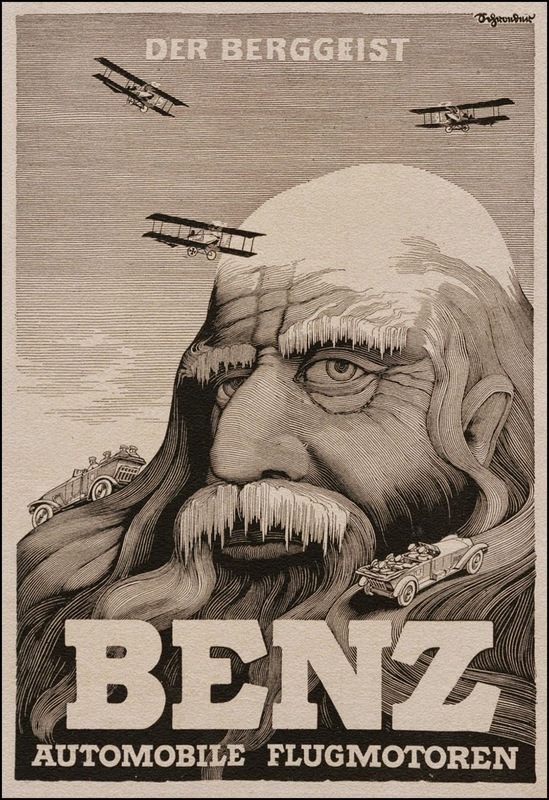 This is a freaky cool German ad from 1917. Attention getting, ey? 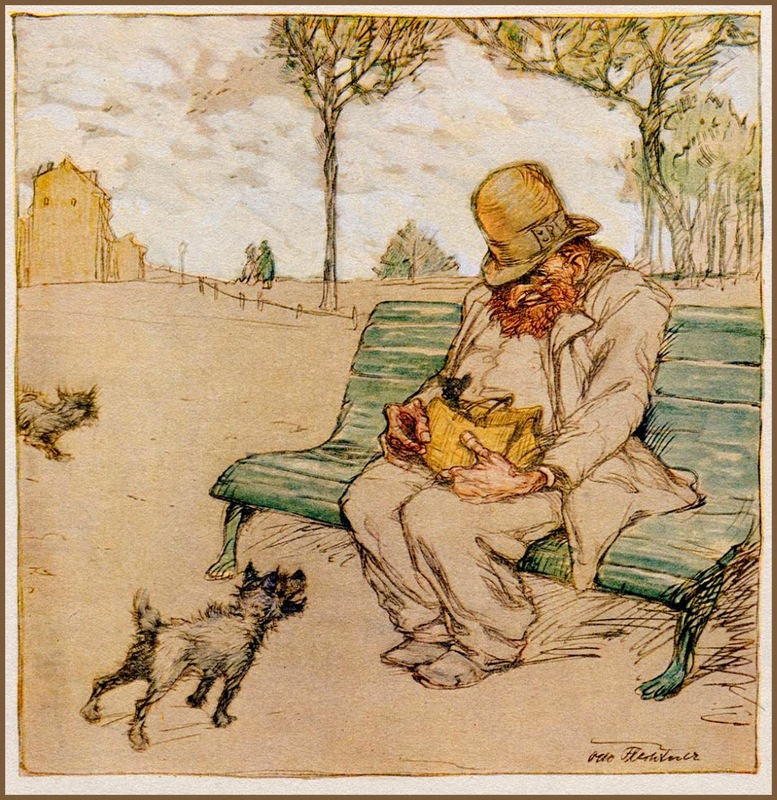 This art looks like it was drawn by Peter de Sève, for the New Yorker or such. 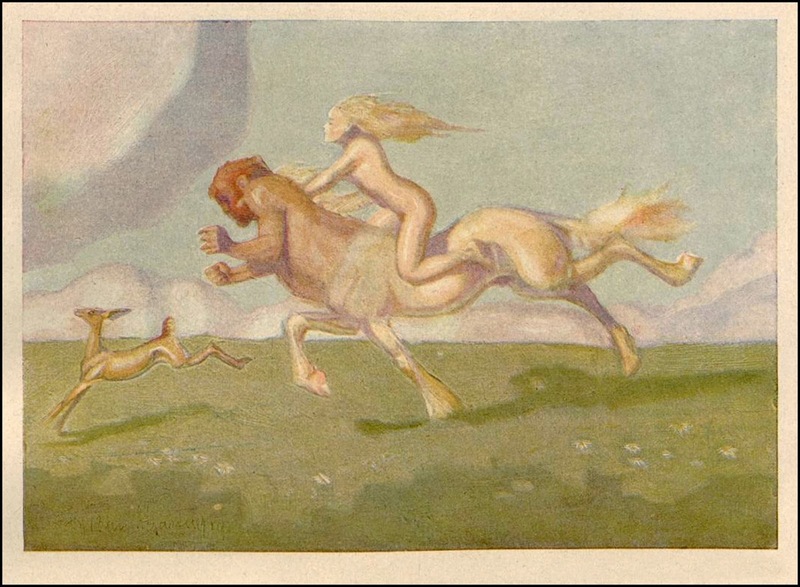 Yet it was drawn by Otto Flechtner some 98 years ago. 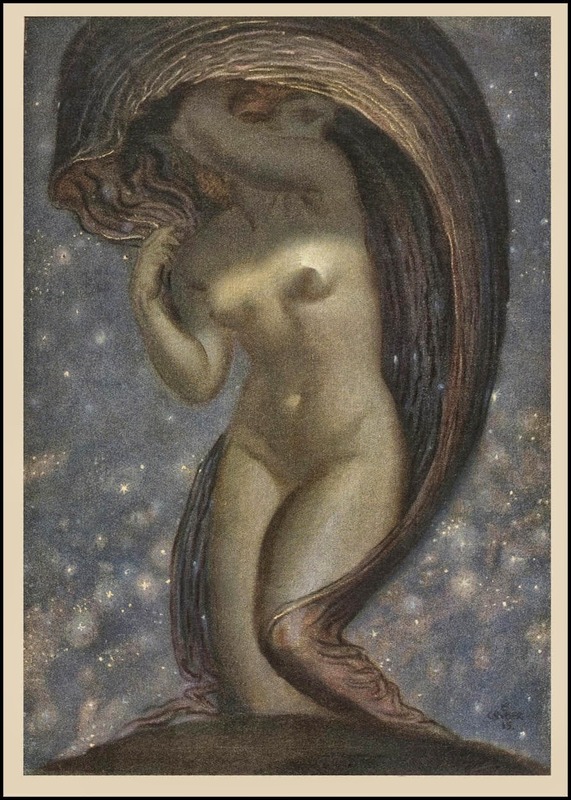 They Seized the Woman and Made Her a Goddess! 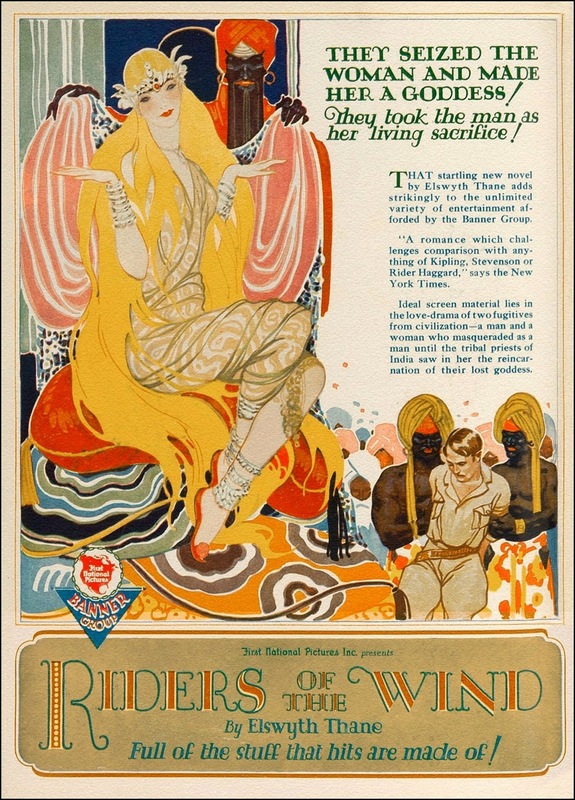 Riders of the Wind by Elswyth Thane was published in 1927 and was a property that was optioned by The Banner Group. There was an effort to shop it around for a movie, but I don't see that it was ever made—though modern reviews of the book are positive. This ad in a movie promotional book is quite striking for its Art Deco/Nouveau-esque qualities. This ad is rare and lovely, is it not? A philosopher has some mighty heavy thoughts to ruminate about, needing a solitary and timeless environment to uncover some truth. Looks like this theorist has found such a place, lucky fool. 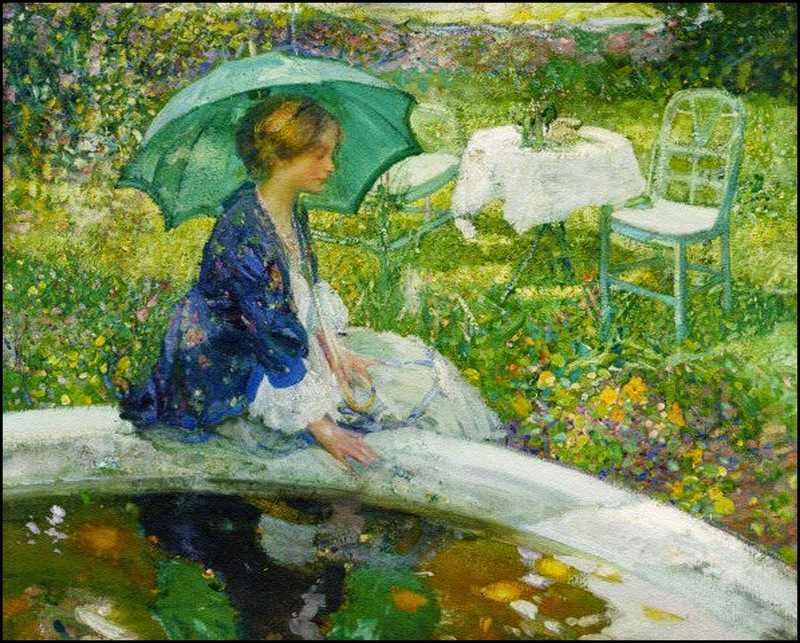 Yep, another impressionist painting by Richard Edward Miller. Yep, another green umbrella. Nope, I'm not complaining. 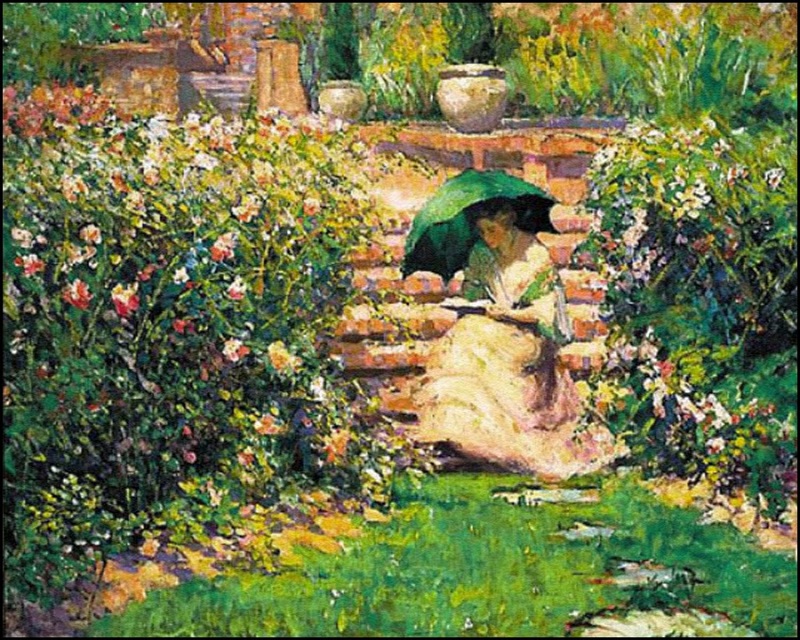 There's something about Impressionists—American Impressionists at that—that liked to paint women with parasols and umbrellas—women with green parasols and umbrellas at that. California impressionism is easy to recognize and is beautiful to behold. 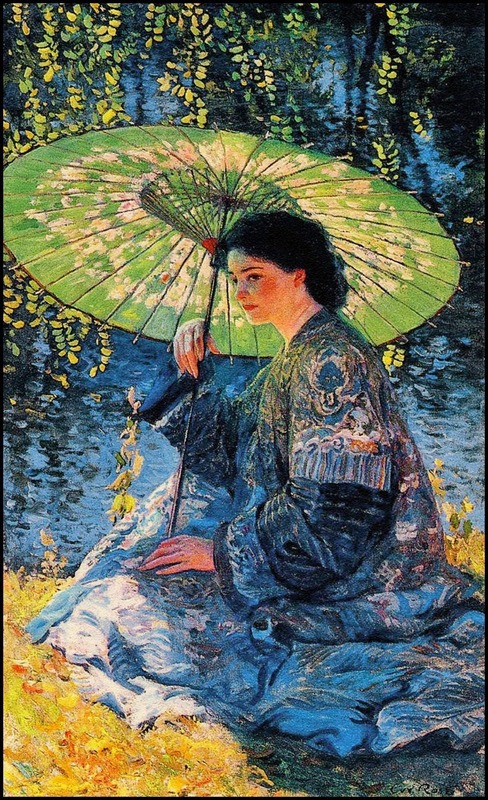 Here, The Green Parasol by Guy Rose, early 1900s.